Today I give fried shrimp pasta for everybody. If you do not have a Pasta, can use Macaroni instead. I don’t say the quantity because anyone like not the same. So just taste more until you are satisfied. First, must boil the pasta before and how to cook depend on the type of pasta that purchased and instruction found at pack (or bag), it is not difficult. Today i use pasta about 1/3 bag because just for 2-3 people. When cooked, leave it and go to next step. Stir-fry garlic and butter until it’s look yellow (About 3 cloves of minced garlic, butter about 1 tablespoon) and chopped yellow onion, then add onion and stir to cook it. 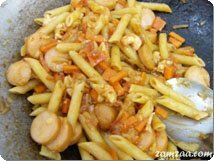 Then add shrimp / stir it a little / then season it with tomato sauce or soy sauce, sugar, pepper, then add sausage and pasta.